Southern Sydney Archives - Adventure, baby! 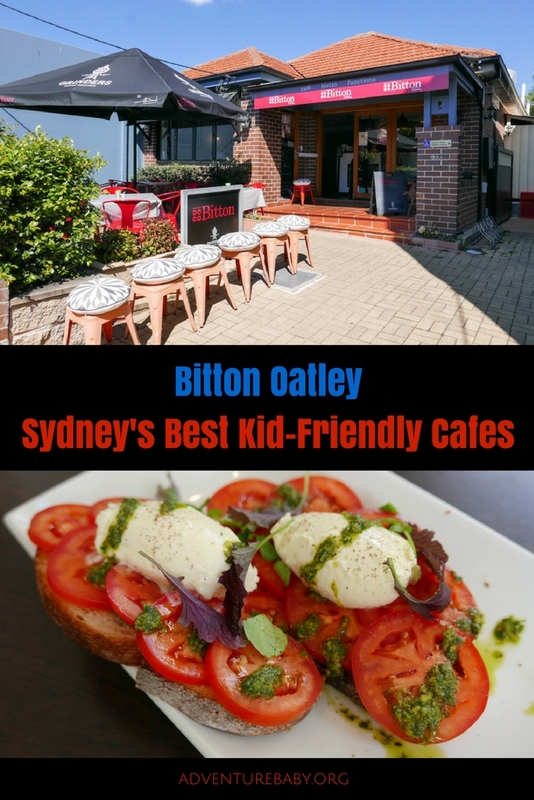 We have been fans of the flagship Bitton cafe in Alexandria for years, so were extremely happy to hear about the new Bitton Oatley site when it recently opened. 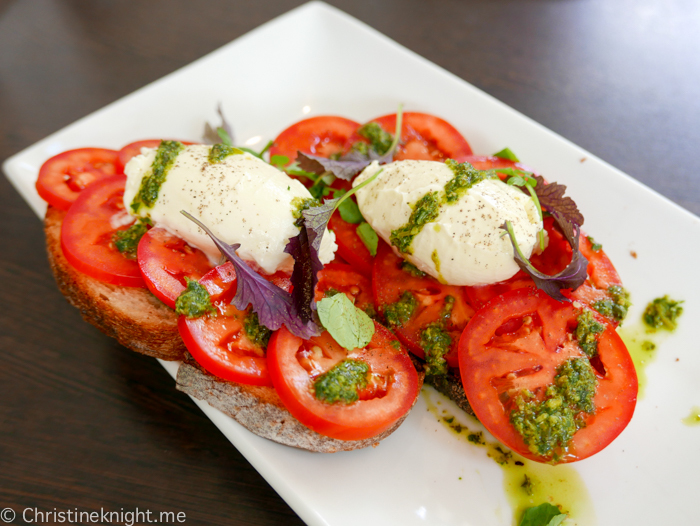 Both Bitton cafes offer a French-inspired menu and share the same philosophy of “five star gourmet at café prices in a friendly atmosphere”. 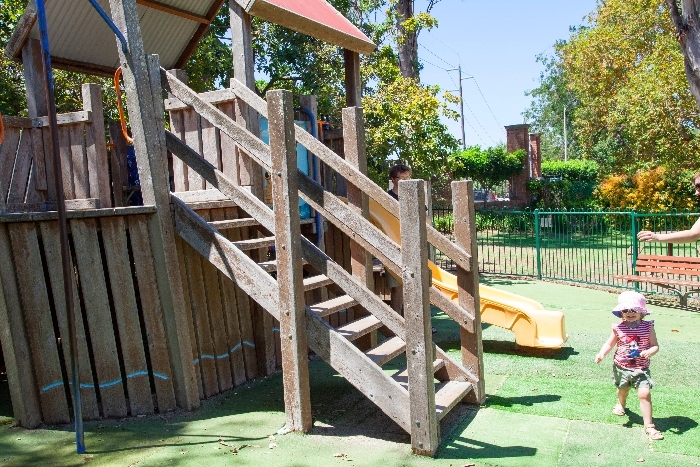 The new Bitton Oatley has a huge outdoor area wth a little play area and some cute landscaping features to discover. The menus are seasonal and baristas serve Grinders coffee. 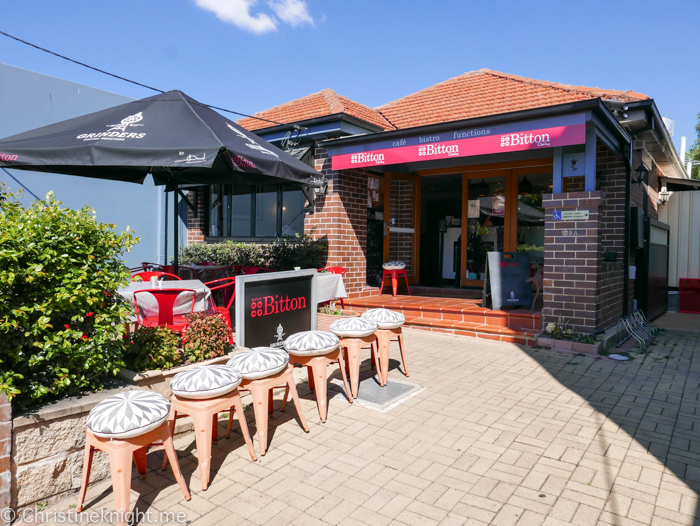 The family-friendly atmosphere of Bitton Alexandria is mirrored here, and on our mid-week visit we see mums and bubs enjoying babyccinos in the spacious yard. The cafe is extremely accessible for strollers and also wheelchairs. There is a flat path that leads from the front all around the back and directly into the back of the cafe and yard. 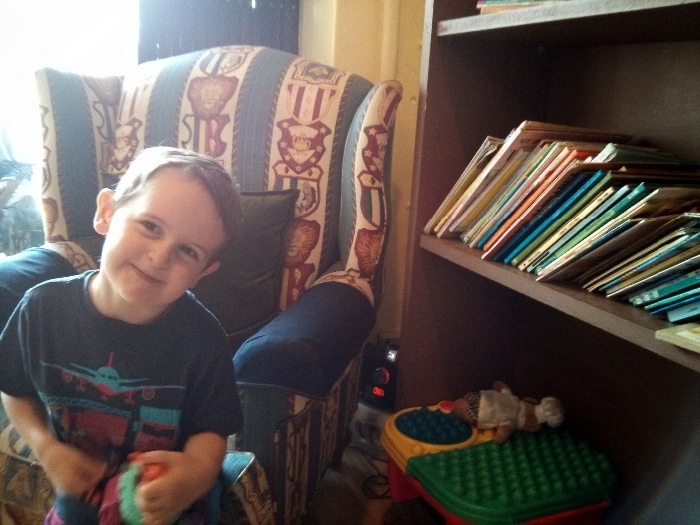 There is also clear access to the bathrooms and a large family and wheelchair accessible bathroom with a change table and even a few spare nappies and wipes. I also appreciated how easy it was to park at the cafe! There is plenty of street parking available on the site streets. 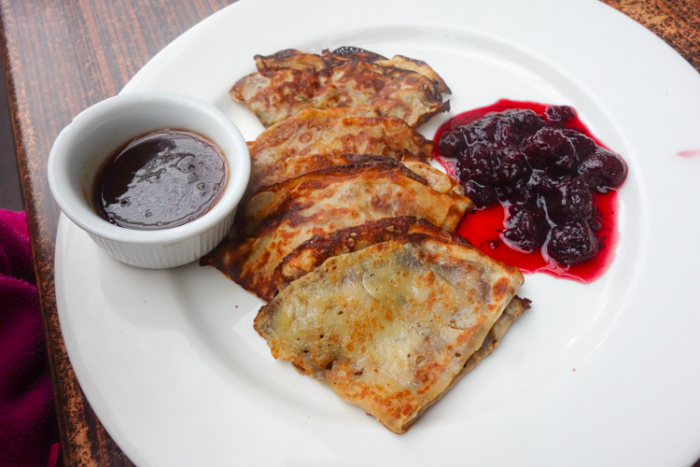 There is a dedicated kids’ menu featuring Scrambled Eggs, Crispy Bacon and Toast, French Crêpes, Steak and Fries, Chicken & Mushroom Pasta, Crumbed Fish Fillets and a Kids Beef Burger (French Crêpes pictured above). 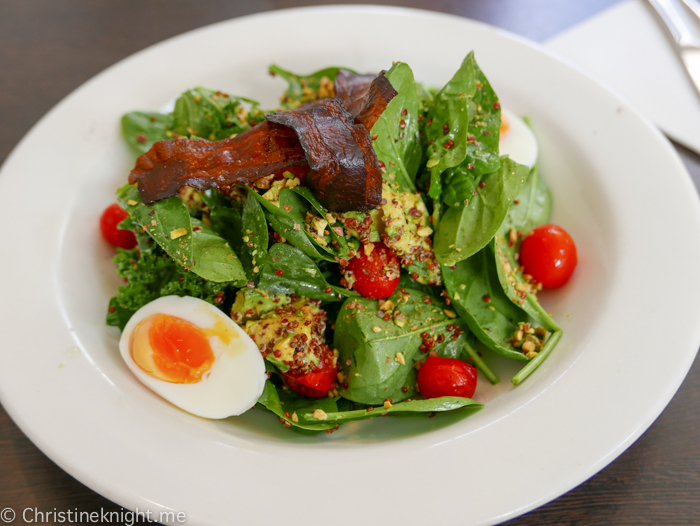 We ordered Breakfast Salad Bowl (Soft Boiled Egg, Avocado, Quinoa, Pistachios Baby Heirloom Tomatoes, Kale, Crispy Bacon, Baby Spinach, GF, $17) and the Tomato and Goat’s Cheese Sourdough Toast with Basil Oil ($17). 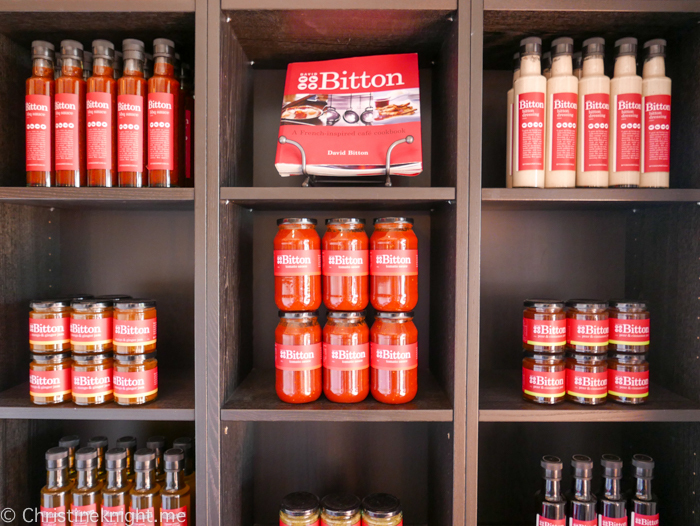 I always know what to expect when we dine at Bitton and this time was no exceptions. 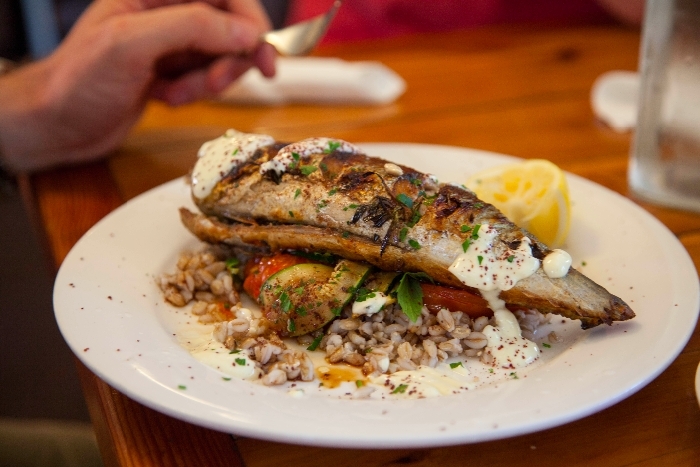 Delicious food made with the freshest of ingredients and served quickly. Impeccable and friendly service. A thoroughly enjoyable experience, every single time. 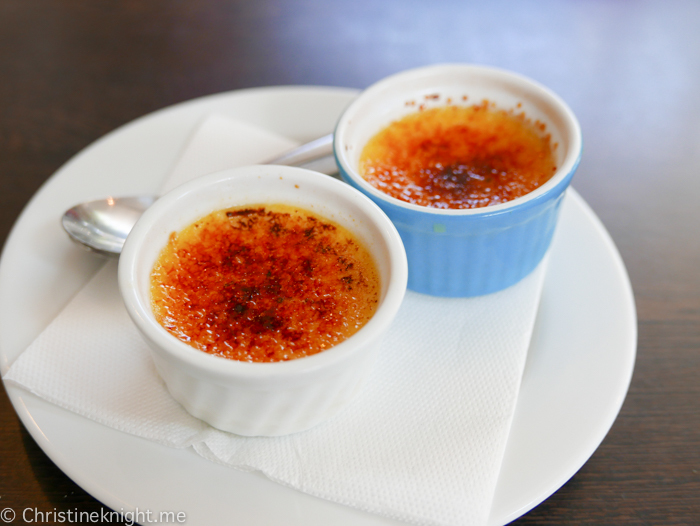 This brunch was made even sweeter by the surprise gift of two free mini creme brulees for dessert. Yum! Hours: Tues & Sun 7am-4pm, Wed-Sat 7am-9pm, Mondays closed. 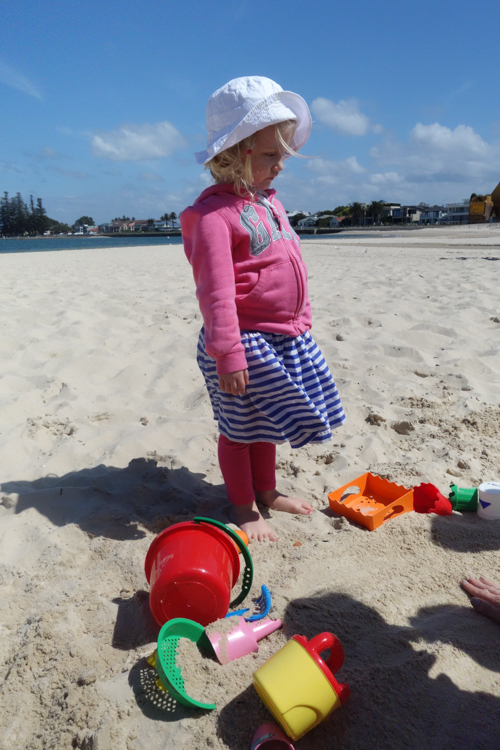 Sydney living is at its best when you spend a day at the beach. 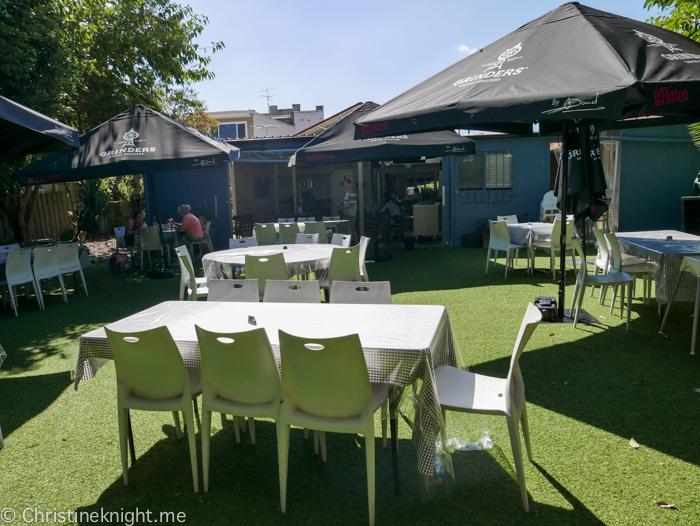 A dear friend lives with her two kids in the Sutherland area, so I particularly love getting over to her part of Sydney to explore her favorite places to take kids to eat and play. 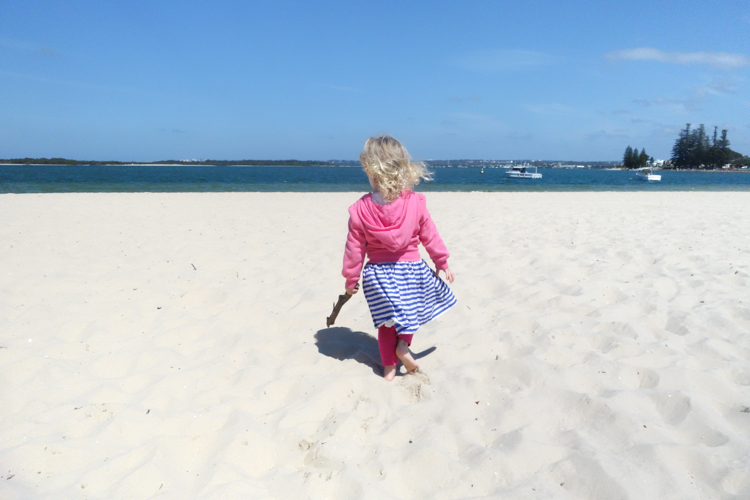 On this particularly warm spring day, we ventured over to San Souci beach, starting at the large playground behind the surf club. 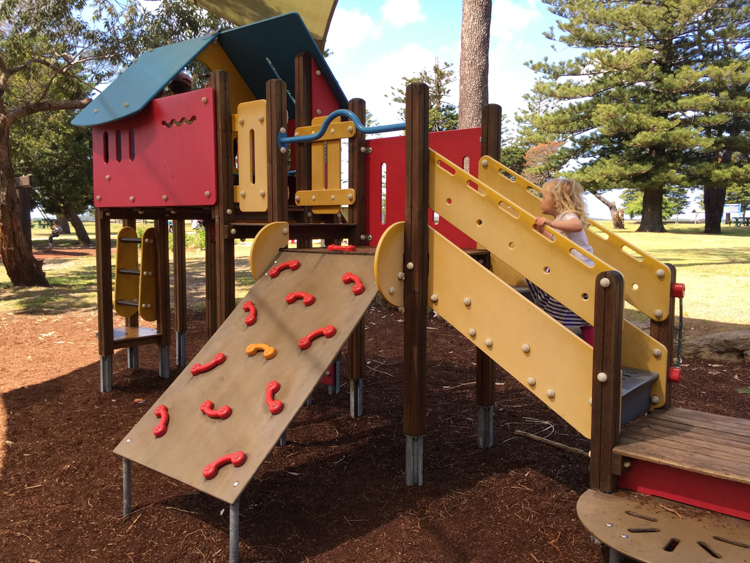 I’ve always found it’s best to let my kid run off as much steam as possible before sitting down for lunch, so we had a long play session on the equipment, which includes a climbing play set, swings, slides, a play boat and even a pretend water ski. 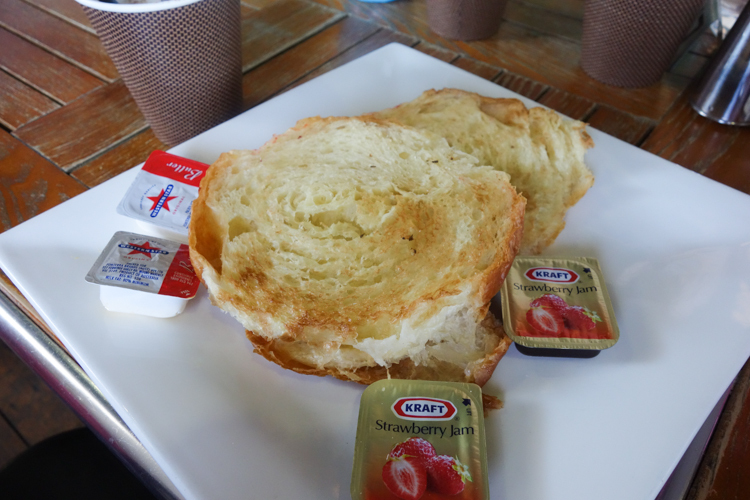 After we were all played out and starving, we walked back to the cafe nearby, Kiss The Barista, for lunch overlooking the pristine white beach. We found colouring books and tubs of crayons at the entrance so each of our little ones could entertain themselves while we waited for lunch. We didn’t see a separate kids’ menu so we ordered them meals off the main one: a croissant with jam, a toasted ham, cheese and avocado sandwich, poached eggs on toast with haloumi and spinach for me, and a fruit salad with yoghurt and cereal for my friend. The kids also received a babyccino and kids’ milkshakes, all of which came in takeaway containers for easy drinking and no spills. The cafe vibe was relaxed, with lots of families and little kids also dining there. Our food arrived pretty quickly and was all very tasty. 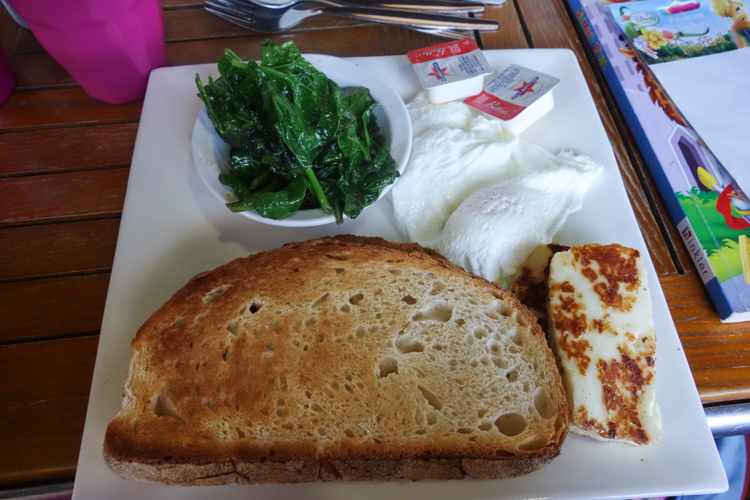 My eggs and toast were delicious, and the haloumi was a great addition to add a bit of extra taste to the dish. After lunch, we walked out the front door to the beach for more play time. Be sure to bring your sand toys and plenty of sun screen! When meeting friends who lived in opposite corners of Sydney, the most central place to meet with our three children was Brighton-Le-Sands. 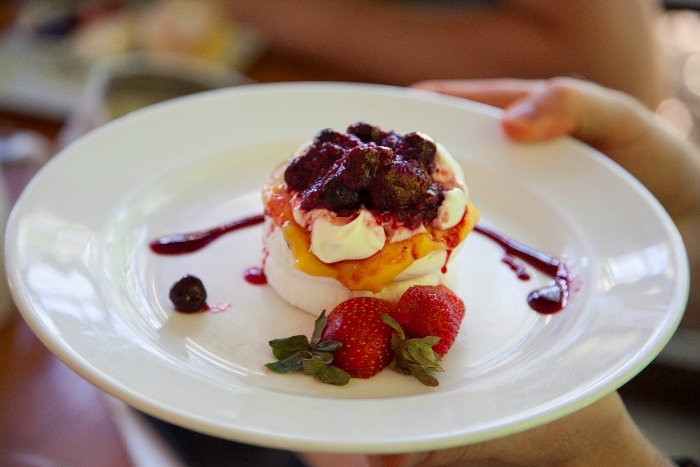 Bay Vista was chosen for our venue due to the delectable menu — desserts galore. We met for breakfast on one glorious winter’s day, on a quiet Tuesday morning. 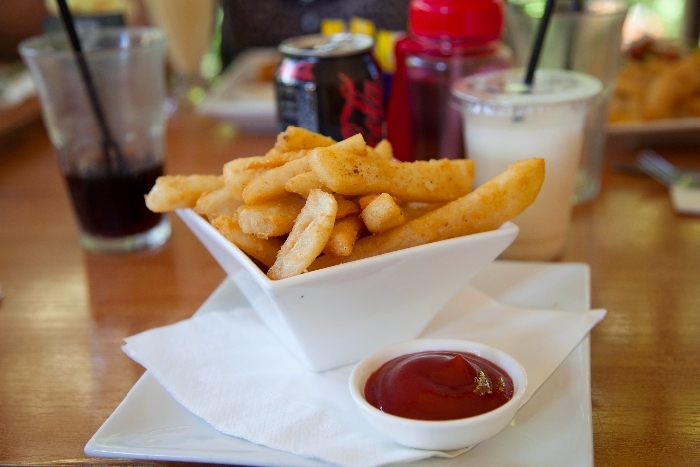 Bay Vista opened in Brighton-Le-Sands in 1991 by Bill Mougios, a restauranteur who dreamed of creating a restaurant where young and old could enjoy simple treats in a casual environment. The cafe is now famous for their dessert menu, featuring ice cream, pancakes, sweet crêpes, waffles and a huge selection of cakes. 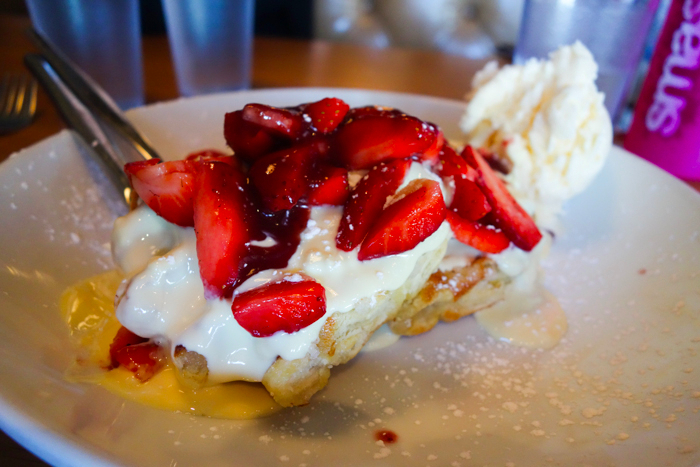 On our visit, we ordered the Strawbana Pancakes (two buttermilk pancakes with a scoop of vanilla ice cream, strawberries, banana and your choice of sauce – I chose butterscotch), Strawberry Waffles, and the Traditional Cinnamon Scroll with Canadian maple syrup. 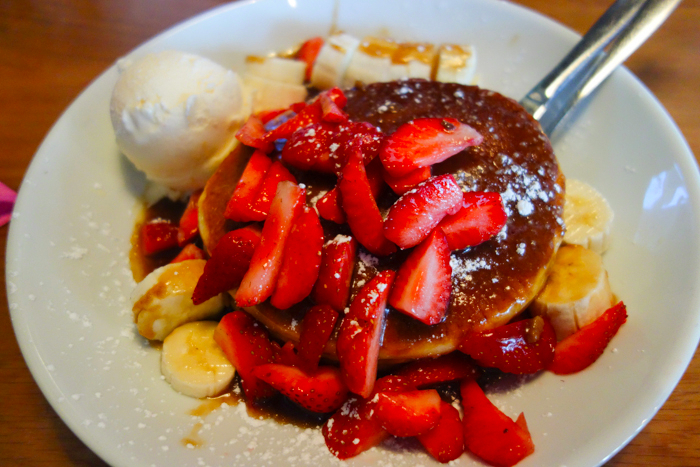 The pancakes were light and fluffy, with a huge amount of fruit. The kids shared our dishes, plus a Kids Strawberry Milkshake and Babyccino. The milkshake was a great size for kids, serves with a large straw for easier drinking. The babyccino came with two (!) marshmallow and looked like a perfect tiny coffee. Cute! After breakfast, we took the kids right across the road to the beach. 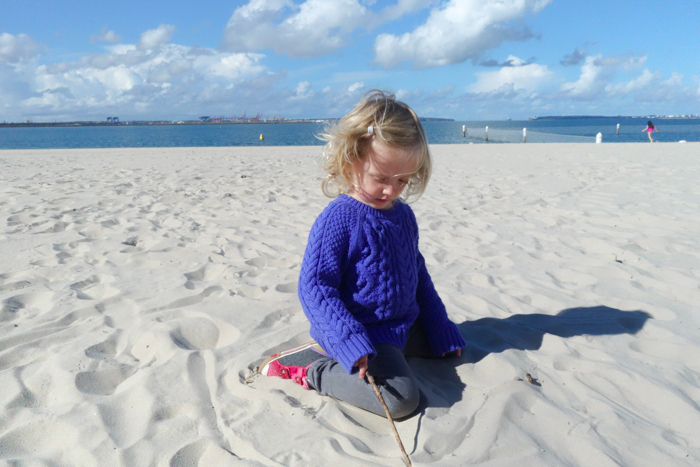 Miss E happily played in the sand for about an hour and a half with no other toy than a few sea shells and a stick. A successful outing for us all! 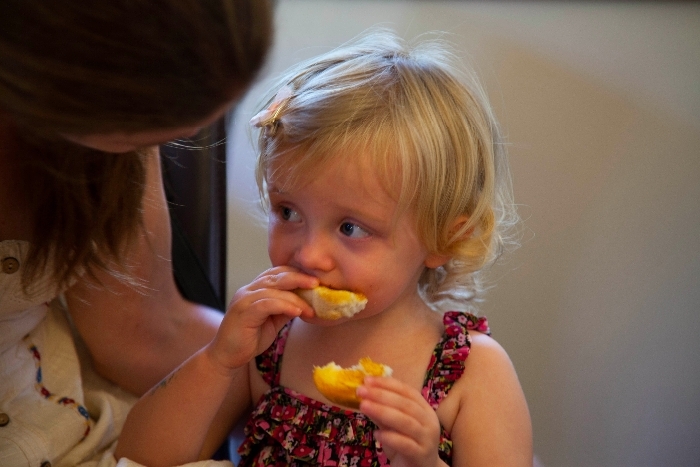 Last bite: A dessert heaven made for kids and adults alike. Take kids to the beach afterwards to run off their sugar-high. 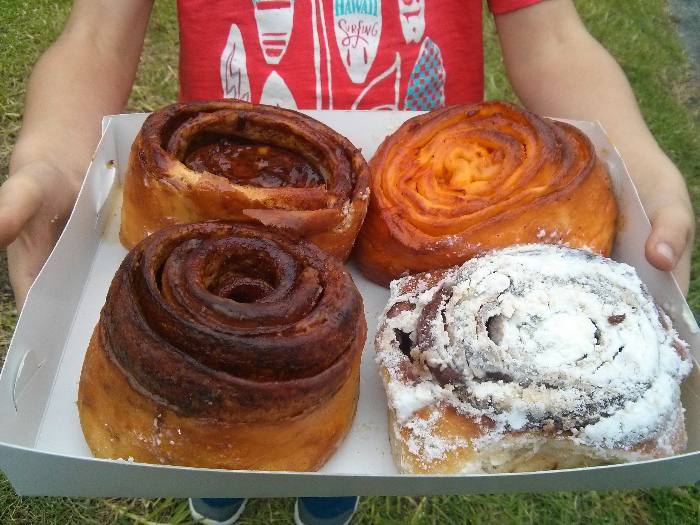 Having seen Oregano Bakery scrolls at many cafes dotted around the Sutherland Shire and yet to taste their delicious goodness we decided to head to the source and sample some treats on a gloomy late Sunday morning. Arriving closer to lunch time the savoury menu appealed and with good cause. 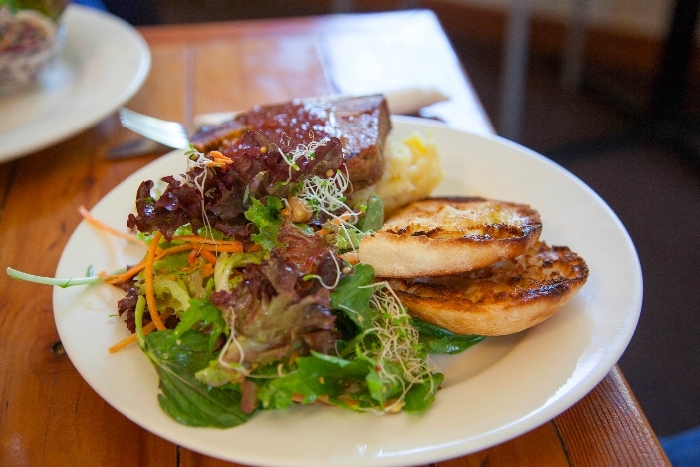 The menu is succinct yet varied with plenty of options for kids and adults alike. 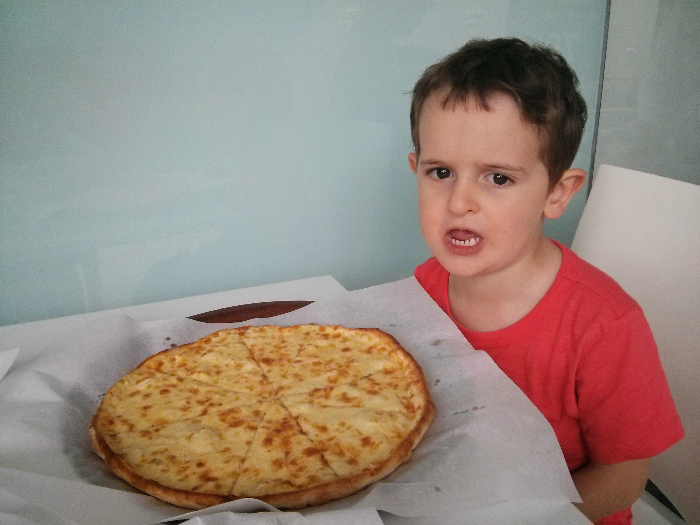 We opted for a Cheese Pizza ($6.50) for the children, Zaatar Wrap 1 – Sonia’s Special ($9.00) and a Sujuc Pizza with Egg ($9.00) and this was plenty of food for us all. 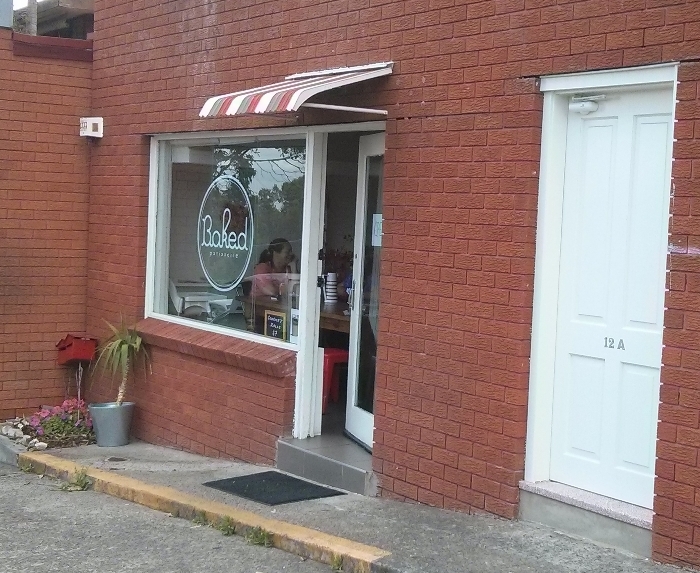 Oregano Bakery is modern and very popular with the locals, with many people having familiar conversations with the staff — a good sign of repeat customers! Our intention was to stick around and enjoy a sweet end to our lunch — however Miss Isla had other plans so we opted for takeaway scrolls to eat in comfort of our warm home! 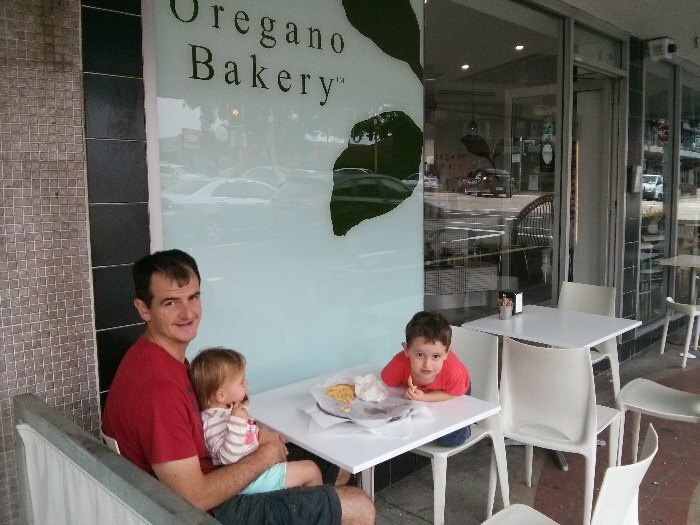 Last Bite: Oregano Bakery is a popular cafe, great for a sweet treat and coffee or some tasty Lebanese food in Southern Sydney with children. 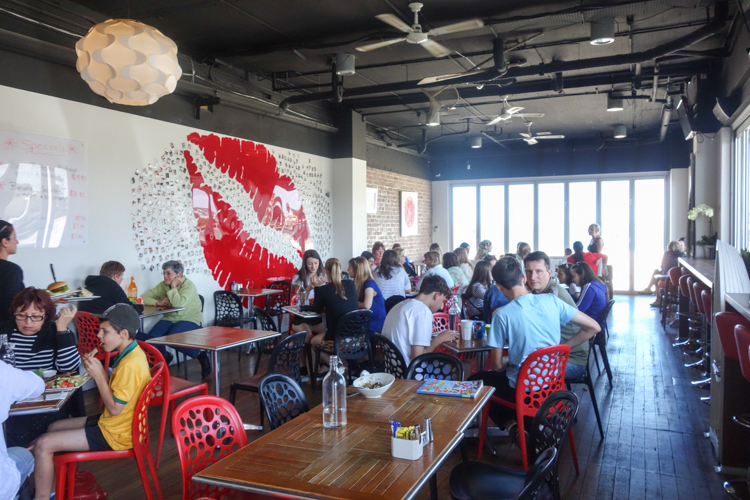 Easy going, relaxed with friendly service make this a great kid-friendly place to eat. 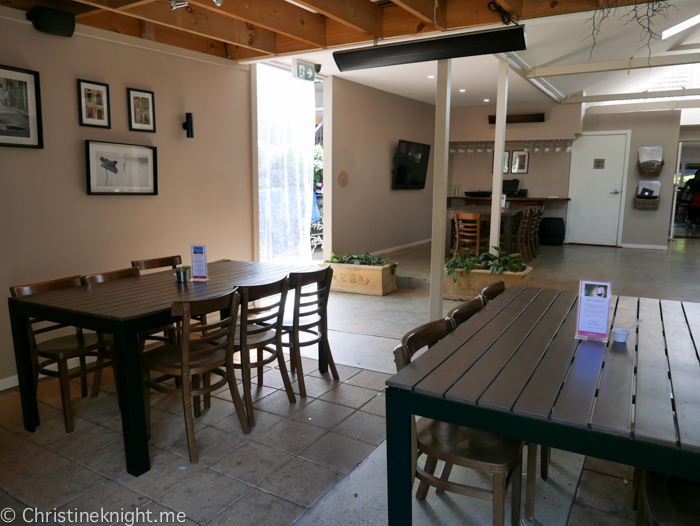 Highchairs: Yes – only one visible. Kids’ menu: No. But Kids won’t starve. Katia Barker is a 30-something stay-at-home mum to two beautiful (though sleep-adverse) children (Jenson 4 3/4 and Isla 22 months). Pre-baby life rendered a highly organised, efficient and calm advertising professional whose outlook on life was to absorb all of what life would throw at her. Now, all that is being thrown at her is food in its various incarnations. Katia’s new future includes educating and opening her children up to what the world has to offer, including food! and renovating her dream home (oh and getting that haircut which is seriously overdue!). Secreted away in Sutherland is The Teahouse Camellia Gardens. Follow winding roads and walk through beautiful gardens to find your way to the Teahouse, a tiny oasis of gentile calm in the Shire, where you can wisle away an afternoon elegantly, drinking tea, nibbling scones and looking over the lush gardens below. Or, if you have a small child, briefly enjoy this experience, and then use the playground next to the teahouse to wear them out. 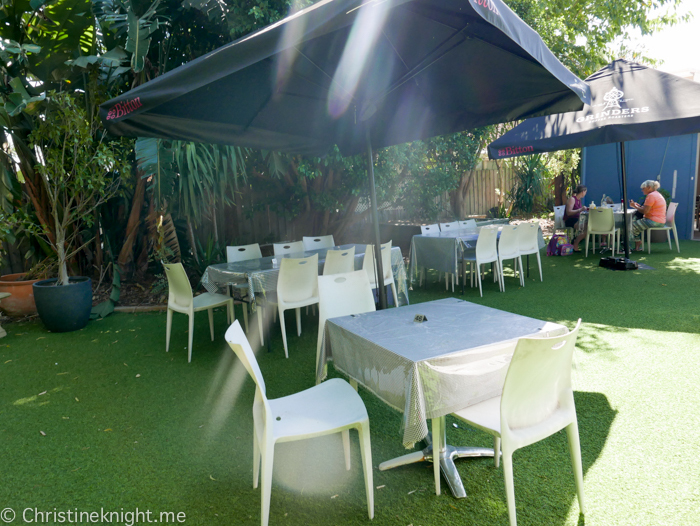 Bookings on weekends are advised as the Teahouse is a popular spot for parties and baby showers. We arrived without a booking and did have to wait a while for our table. 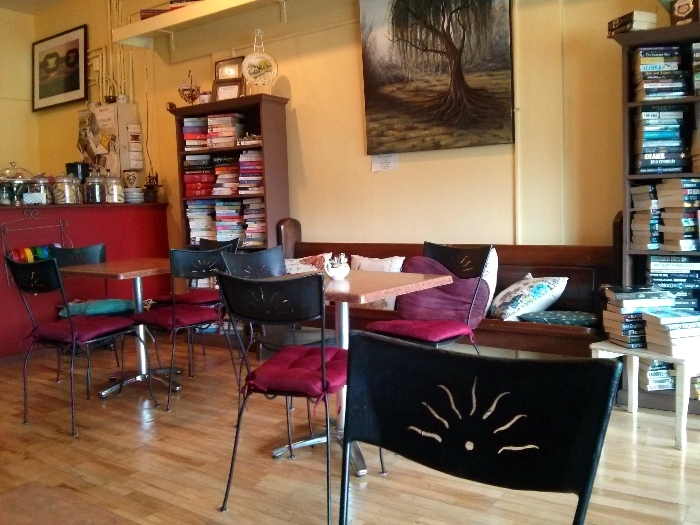 The Teahouse is laidback, with service a bit on the erratic side. We had arrived on a busy day, which may explain the service (I like to give the benefit of the doubt!). 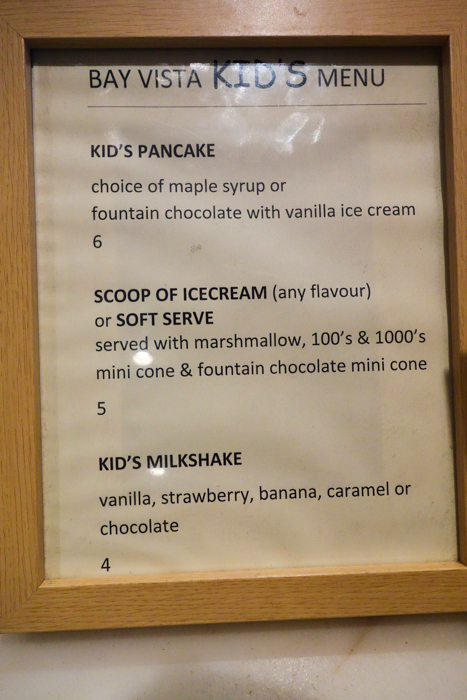 As a popular family destination, the Teahouse features a large kids’ menu, with breakfast options (such as the Scrambled Eggs & Toast, $6.50), lunh options (including cooked “meal deals” for $10.90, or sandwiches from $4), and snacks and beverages, like kiddie shakes ($3.50). Since Missy E is a picky eater, we ordered her the shake, a juice popper (we were using sugar to combat jetlag at this point), and a bowl of Beer-Battered Chips ($5.50). The rest of our party ordered various items from the lunch menu. Unfortunately, since it was such a busy day, many of the items were sold out, including the only vegetarian option. The staff were happy enough to make me a salad sandwich however (as long as it was on their only remaining bread, foccaccia). 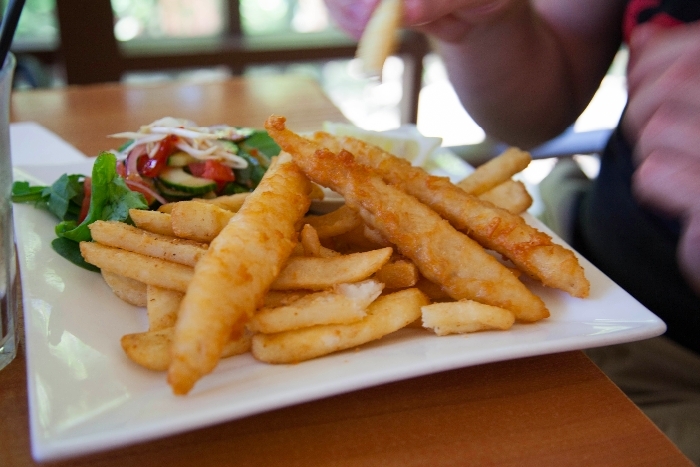 Other dishes ordered included: Crisp Beer-Battered Flathead Fish & Chips served with Salad & Tartare Sauce ($18.50), Salt and Pepper Calamari with a Papaya, Green Mango, Cucumber Ribbons, Bean Shoots, Mint & Coriander Salad topped with the Teahouse dressing & Lime Aioli ($18.50),and the Teahouse BLT, with Bacon, Lettuce, Tomato, Mayonnaise served on Thick Cut Toast & Chips ($14.50). While it was a bit of a wait to get the table, and we were warned that the meals might be slow, they actually arrived very quickly. The chips were crisp and cooked all the way through (yum! 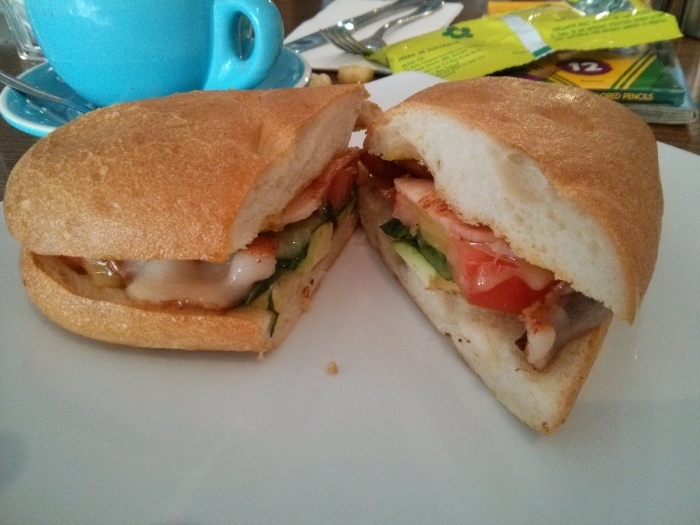 ), the sandwiches served with fresh produce. It was a solid meal — nothing outstanding, but nothing bad either. Desserts were another matter — and to be expected from a teahouse. 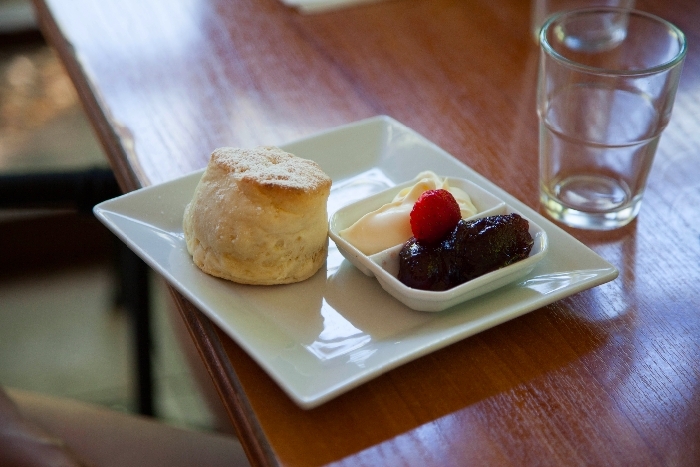 The scones ($4) and mini pavlovas ($8.50) were absoutely spectactular. We would absolutely come again just for afternoon tea. 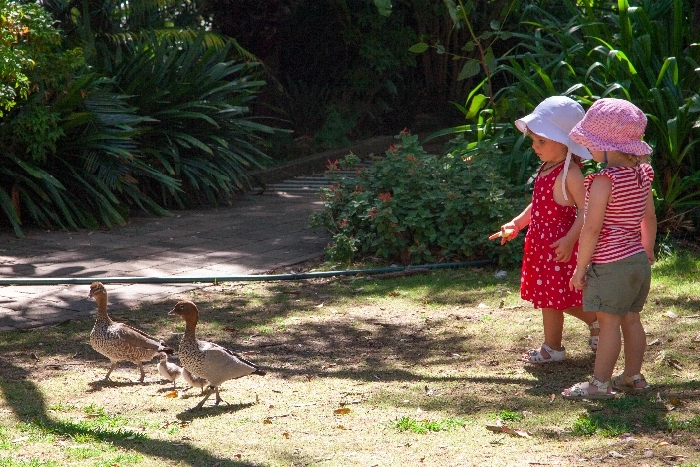 After indulging on scones and pavlova, buy a bag of duckfood for 60c from the teahouse, and wander through the gardens to feed the feathered inhabitants. They’re well-used to visitors and are not overly concerned about the smallest of new friends, especially when they come bearing food. 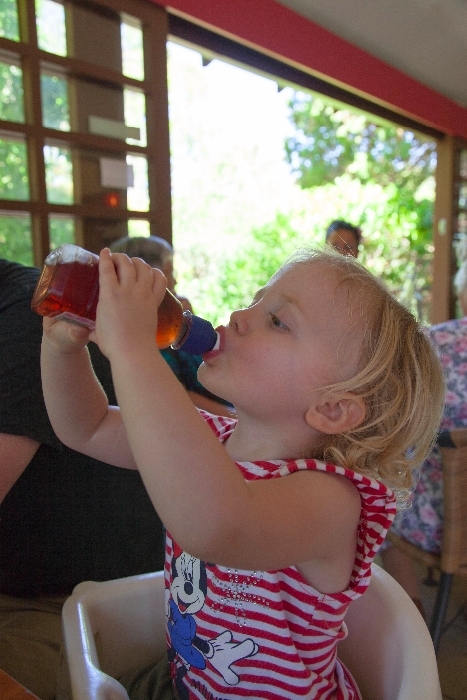 Last Bite: The Teahouse is a delightful way to spend an afternoon with kids. 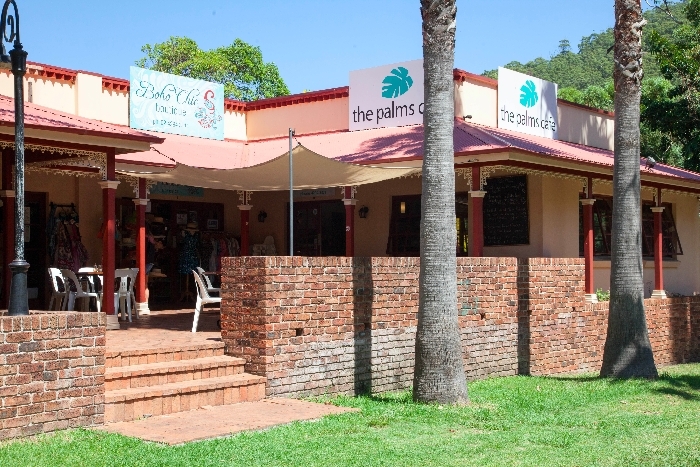 In the heart of scenic Stanwell Park lies an unassuming little cafe: The Palms. 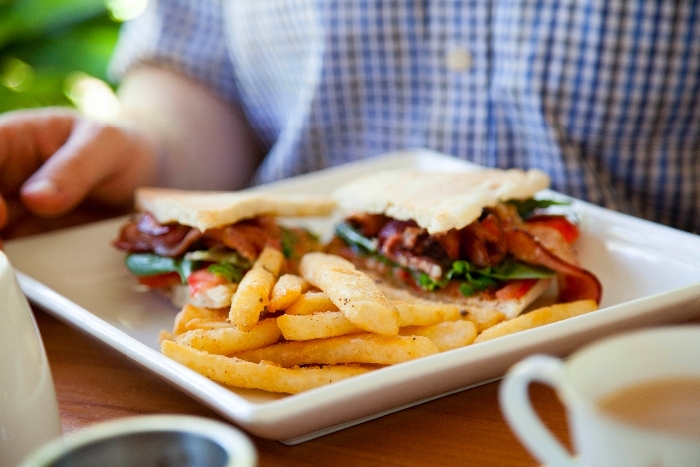 Drive too fast around the bendy road and you’ll miss it completely — much to your own detriment, as it’s a perfect spot to grab lunch with family. We dropped by on a Friday afternoon. The cafe was busy with couples and families with young kids (perfect!). 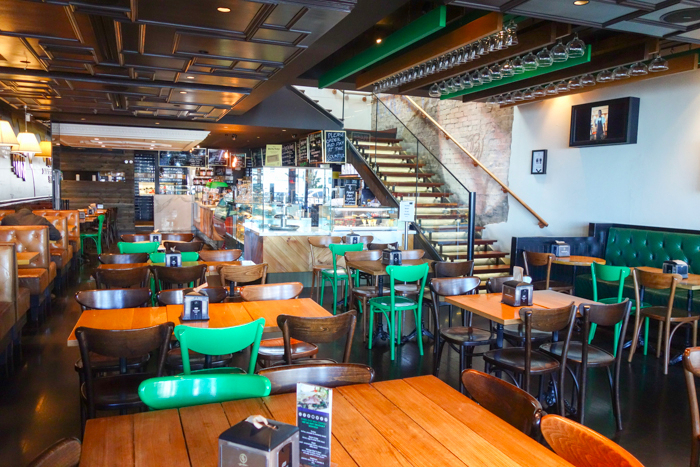 Nothing special for the kids — just friendly staff, fast service and really, really, really good food. The cafe features all-day breakfast, hearty meals made with fresh, local produce, and devonshire tea and cakes baked fresh on the premises. Our party ordered the Fish of the Day ($24), Homemade Meatloaf (potato mash, tomato jam, salad & turkish bread, $18.50), Slow-roasted Honey Mustard Beef on Damper (mustard dressing & fresh coleslaw, $17), The Palms Big Breakfast (smokehouse bacon, old english pork chipolatas, tomato, mushroom, hash brown, fried eggs & toast, $20), Sweet Corn & 3 Cheese Fritters (usually comes with chorizo but I swapped it for avocado, tomato & spinach salad, $17), and Bluberry Banana Bread (with ricotta and strawberries, $8). Every meal was perfectly prepared and presented. The waitress was extremely flexible with our picky eaters, offering substitute items for things that weren’t wanted (the first time I’ve ever encountered this!). 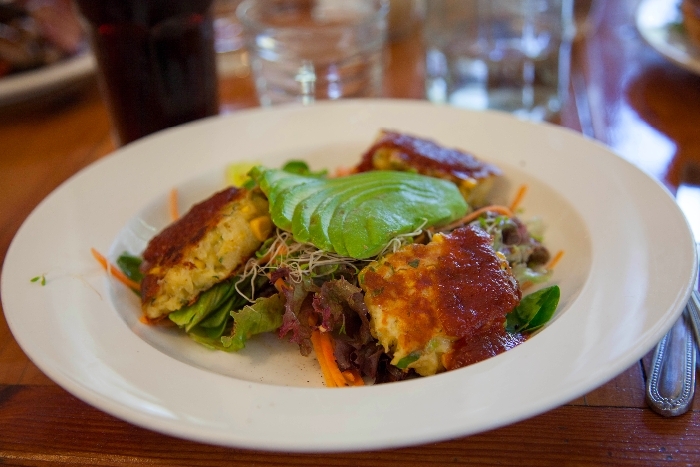 My sweet corn fritters were bursting with juicy corn, and the salad lightly dressed — a perfect combination that left other members of our party with food envy. 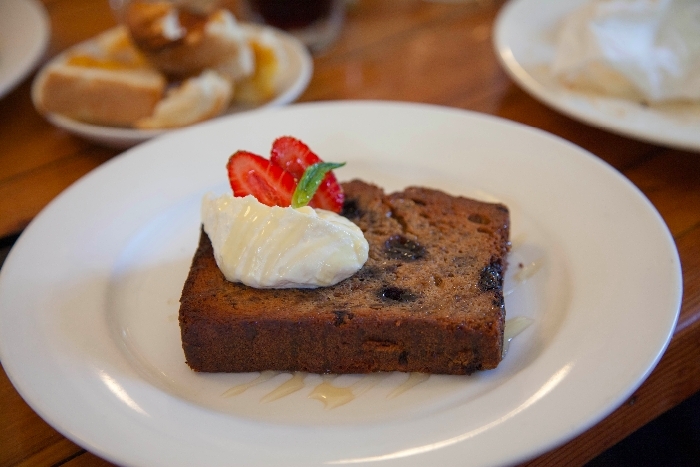 Miss E wasn’t overly hungry and snacked on bread, refusing to even try the delecatble blueberry banana bread. 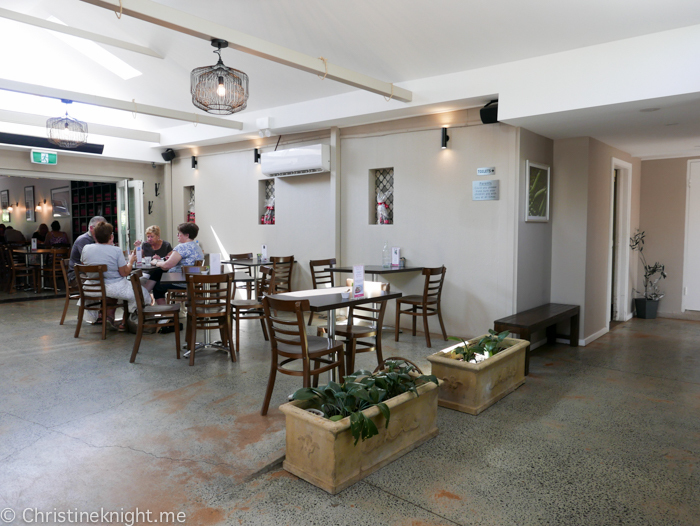 The Palms Cafe is in a perfect location for lunch on the way to or from some fun outings in the Sutherland/Wollongong area. A few minutes further down the road and you’re at the beach. 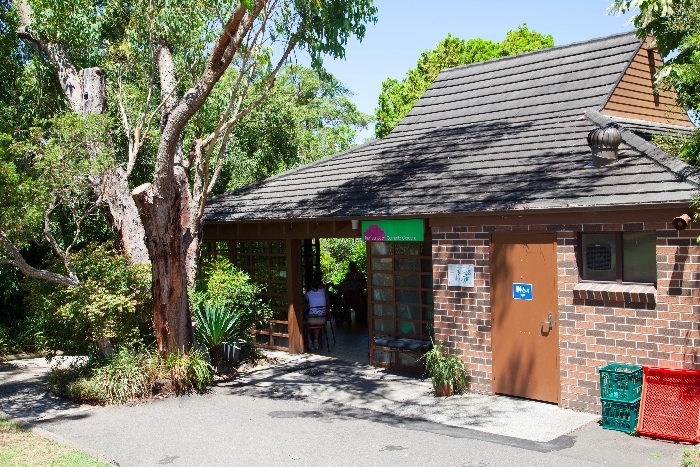 The cafe is also only a few minutes from Symbio Wildlife Park (check out our blog post for more info!). 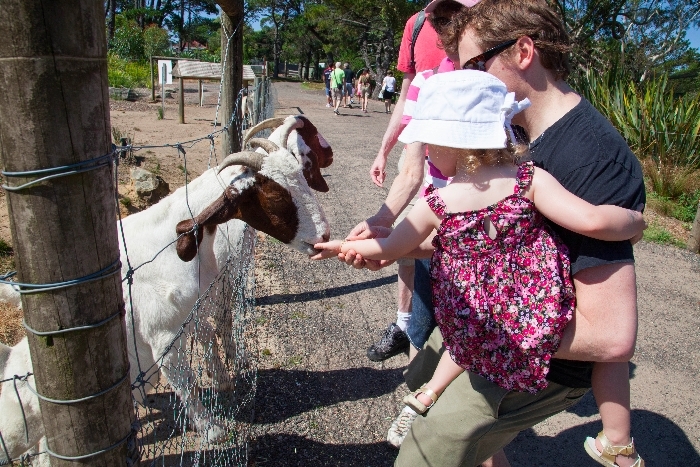 Nestled in the quiet suburb of Helensburg lies Symbio Wildlife Park, a tiny zoo that makes for a great afternoon of wildlife encounters — particularly for little kids. 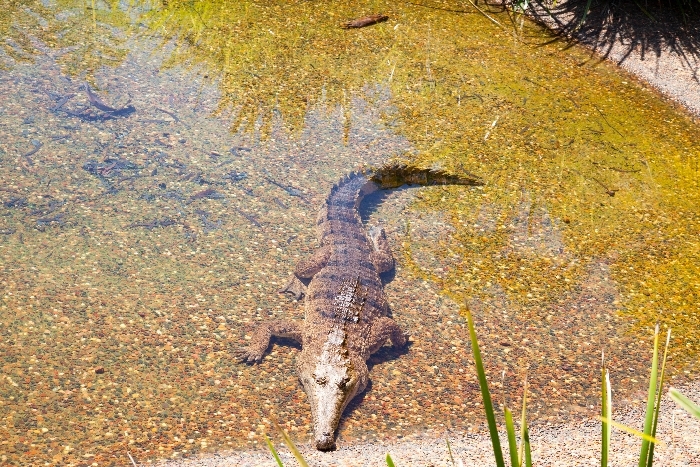 Symbio boasts “we’ll get you closer”, and there are indeed opportunities to get up close to lots of animals. 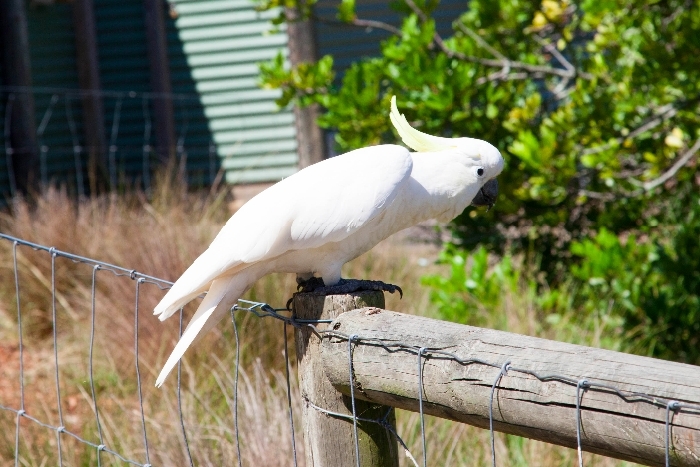 The grounds are spacious and well-kept, and the animals all healthy and happy looking. 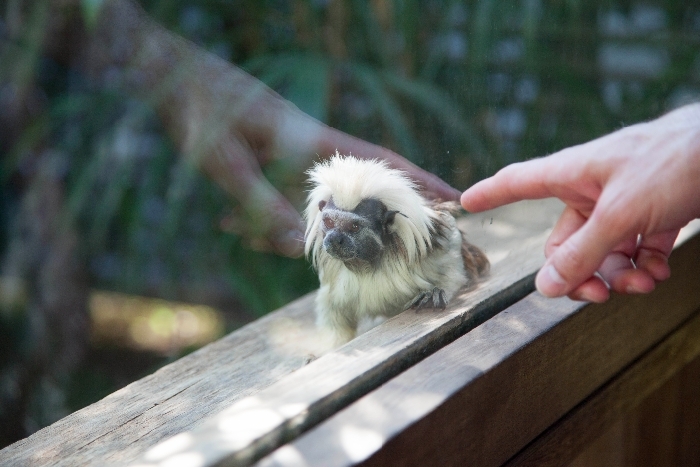 No sad depressed animals in tiny enclosures here. We arrived just in time for the koala talk. 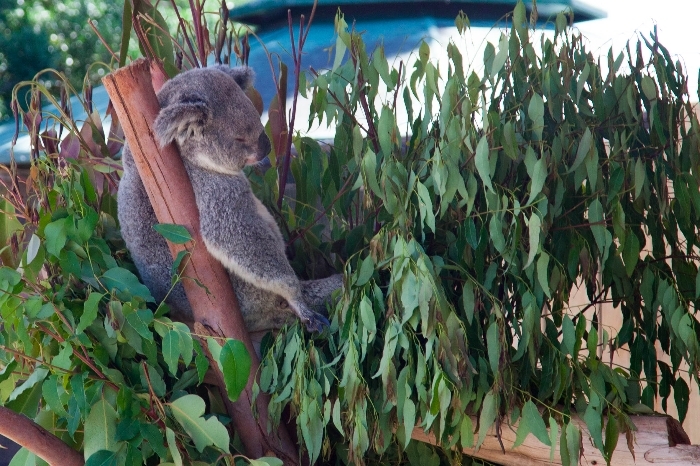 It was an informative session with lots of great info that I didn’t know about the koala. It was a little over the heads of the littler kids though — better for older kids and adults, as the tiny tots were getting restless. The talk usually ends with the opportunity to touch a koala, but our koala was a newbie and people-shy, so no pats for our sad toddler, despite her repeated exclaimations that “he’s so cuuuuuuute!”. 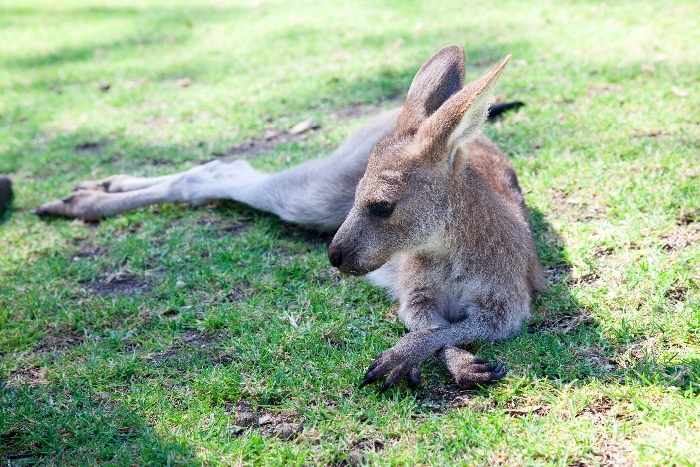 The biggest hit for all of us was the walk-through kangaroo enclosure — a large paddock filled with kangaroos. We had bought bags of animal feed at the entrance so we were ready to get up close and personal with some Aussie icons. 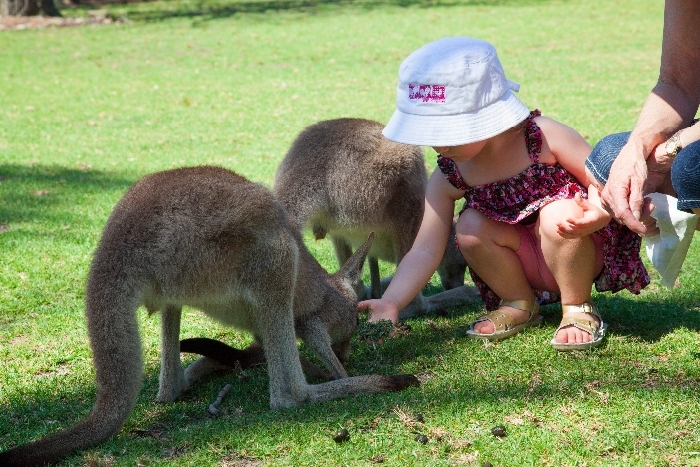 The kangaroos were extremely docile — I would imagine because they’re so used to lots of people being around them. They were very happy being touched and would munch the grass off your hand, tickling your palm with their teeth. We showed Miss E how to feed them carefully, and pretty soon she was able to feed them on her own. The goats also were excited to be hand-fed — they were in an enclosure that they were desperate to escape in their enthusiasum for our grass-like food. These super friendly goats were actually very gentle, and E was able to feed them without loosing any fingers. There were actually a lot of animals roaming wild, but they kept their distance from us (good call, toddlers are notorious animal-chasers). We spotted peacocks, ducks and cockatoos cheerfully roaming the grounds. 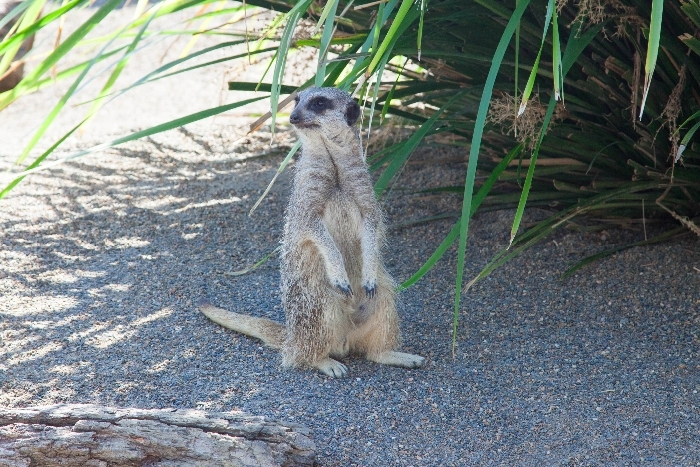 As well as having standard farm animals, the zoo is home to a few exotic creatures like a Sumatran tiger (who was MIA when we visited his enclosure), red pandas, crocodiles, adorable marmoset monkeys and meerkats. 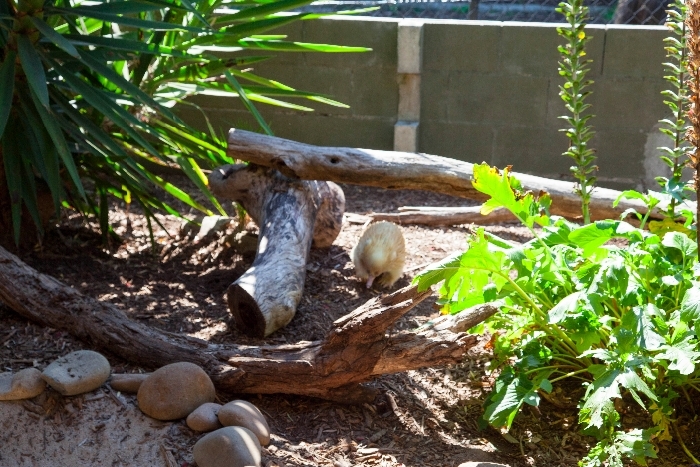 A surprise standout was an albino echidna — something none of us had ever seen before. 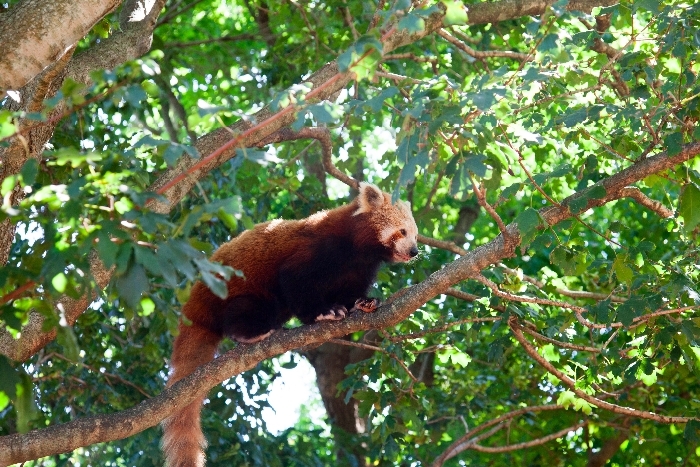 Symbio Wildlife Park is a great way to spend a few hours entertaining kids. 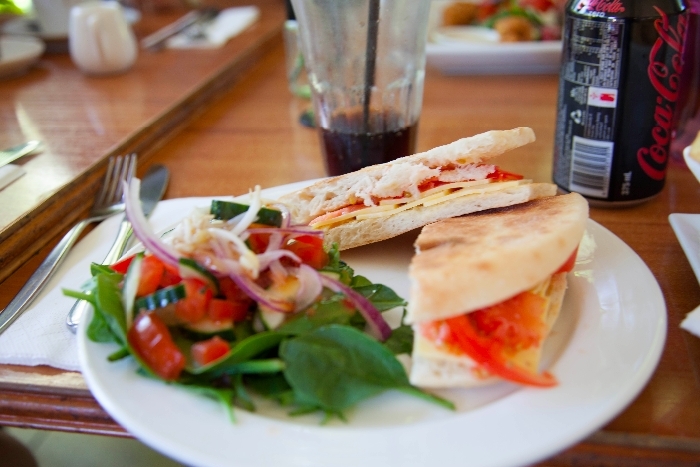 I would recommend lunch at a nearby fave, The Palms Cafe, for delicious food before exploring the park. Prices: Adults $27, children 3-15 years $15. If you have always wanted a café where as soon as you walk in you can relax and the staff address you by name then look no further than Anna’s Shop Around the Corner. 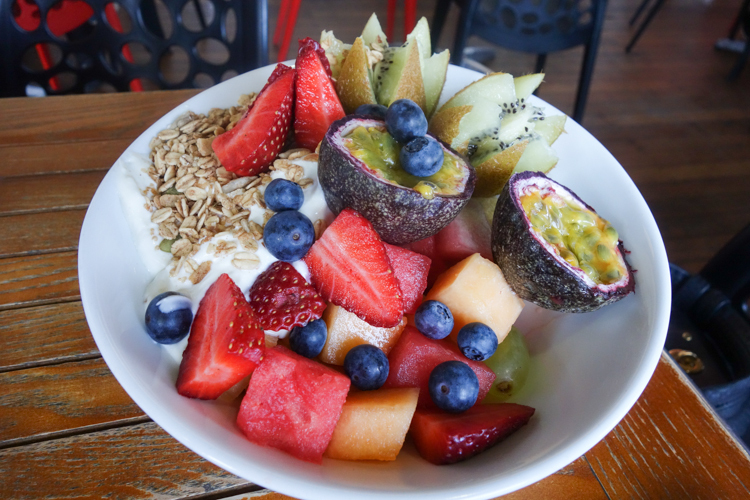 A bit of a Cronulla institution, and recent winner of the Sutherland Shire Local Business Awards for Best Café 2013, Anna’s Shop Around the Corner is a great kid-friendly café. The décor is homely and informal, with walls of second hand (and some new) books for you to read whilst you dine, and sold at discount if you can’t bare to put yours down. Although dining with kids means you will most likely be choosing from the extensive kids book section to keep your little people entertained. 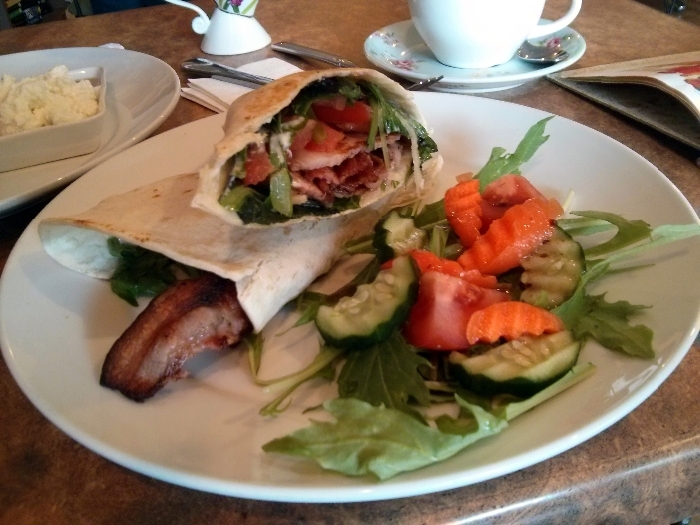 It was just myself, Jenson and Isla today so being outnumbered with children to parent ratio lunch could have ended abruptly, but pleasantly I was able to finish my tasty BLT Wrap ($7.50) and Small Coffee ($3.00). 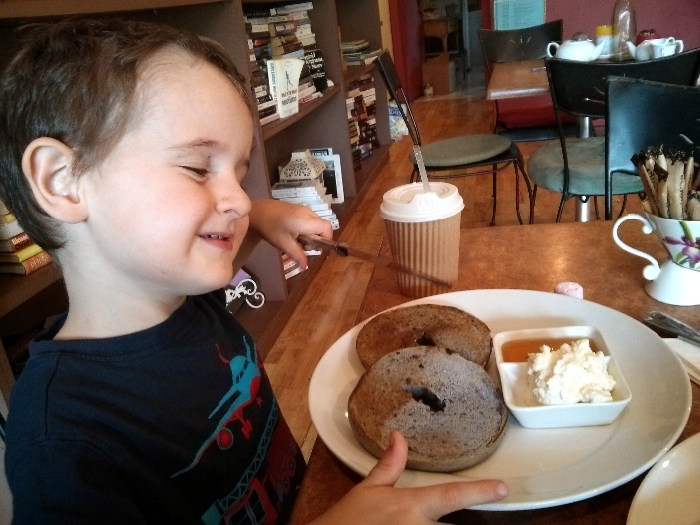 Jenson meandered through his Blueberry Bagel with Ricotta & Honey ($5.00) and Kids Banana Milkshake ($2.50) however we ended up packing half to take away with us. 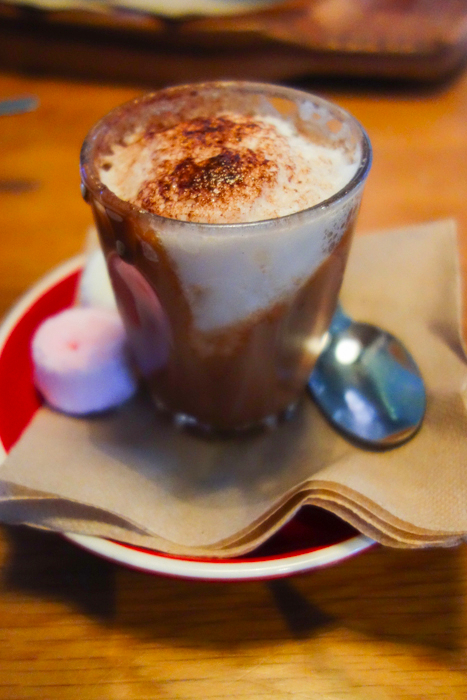 Little elements like a marshmallow and a few smarties with the kids drinks show the owners really care and are welcoming to children, and there is plenty of kids artwork proudly displayed throughout the café which is a nice touch. 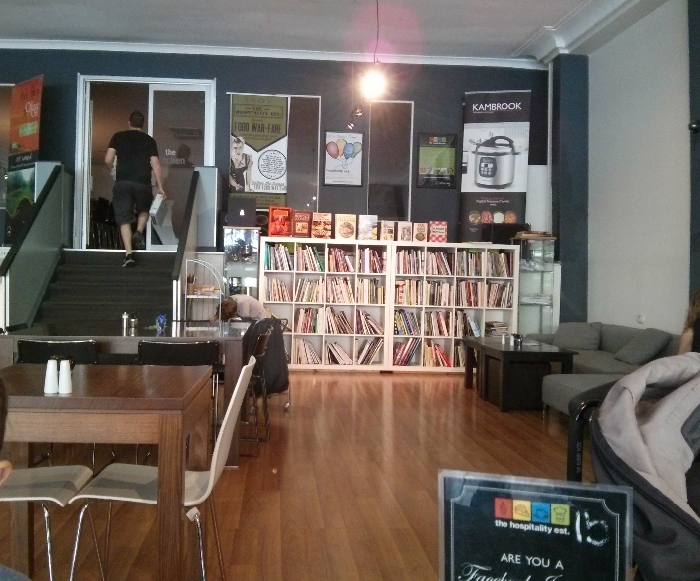 Last Bite: Anna’s Shop Around the Corner is a welcoming kid-friendly café serving tasty food and great coffee. Munro Park is right outside and Anna’s Shop Around the Corner will package up your food for picnic style dining if you prefer – bonus! On a chilly Saturday morning we had a craving for bacon and eggs without much fuss so we decided to head to Hospitality Est. 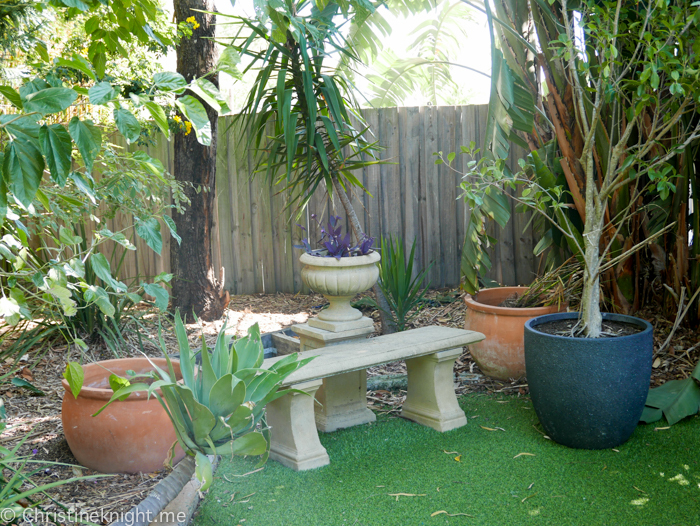 in Caringbah to fulfil our needs. 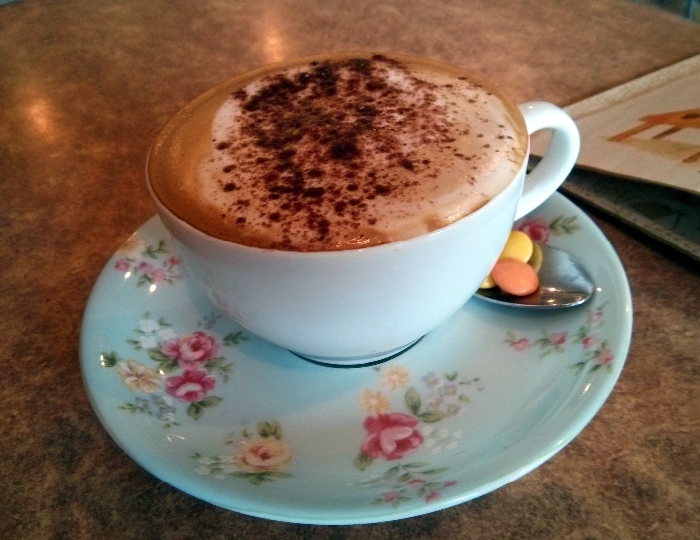 The spacious interior and welcoming staff are the first impressions you get when entering this kid-friendly café. Tables are well laid out, there is a play corner with books, colouring and assorted toys, plus a big comfy lounge to house plenty of children if sitting still at your table isn’t happening. We made sure we arrived in time for brunch, so the breakfast menu was still available and took our picks from the menu. 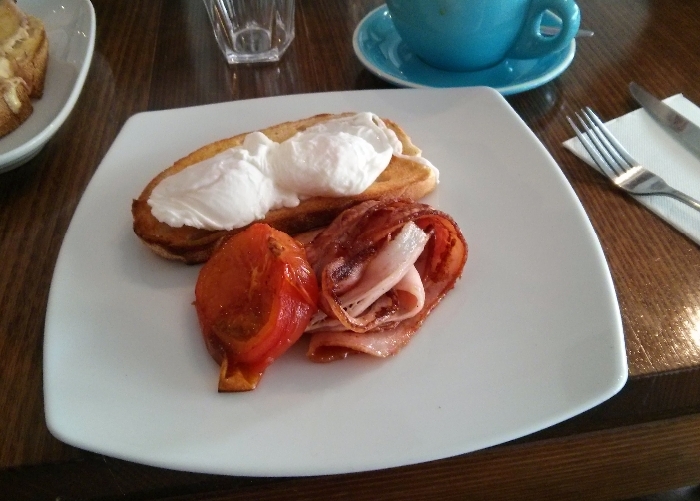 I chose the Breakfast Panini ($10.50), Ross the Standard Bacon & Eggs ($11.50) and pleasingly Jenson was also well catered for with the ‘Little Est. 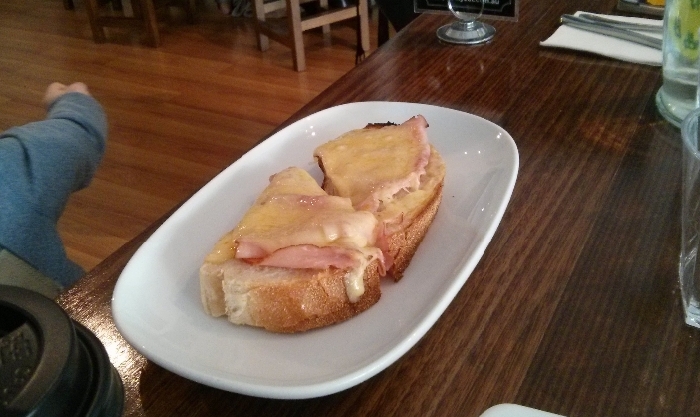 Menu’ Ham & Cheese Melt ($3). 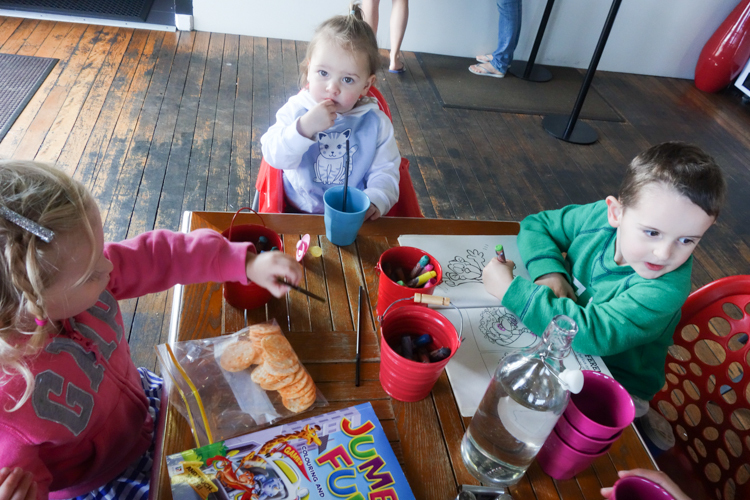 This kid-friendly café has put some thought in to caring for the little ones, with a clever play on their name for the menu and all options under $6. Large coffees warmed up the adults ($4) and the signature milkshake order was not going to be missed. At $2.50 for a small size, this is the most affordable milkshake for kids I have found to date. 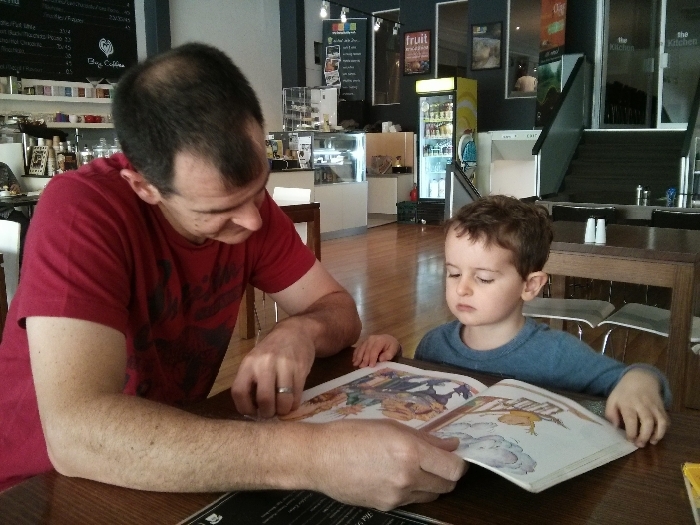 Jenson loves reading, so he selected a book and surprisingly waited quite patiently for our food to arrive. 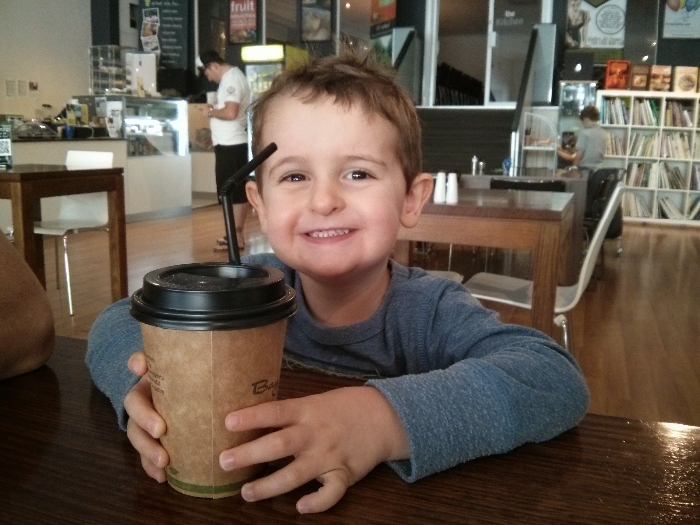 (Although he did nearly take out the waitress running back to our table when he realised his milkshake arrived). 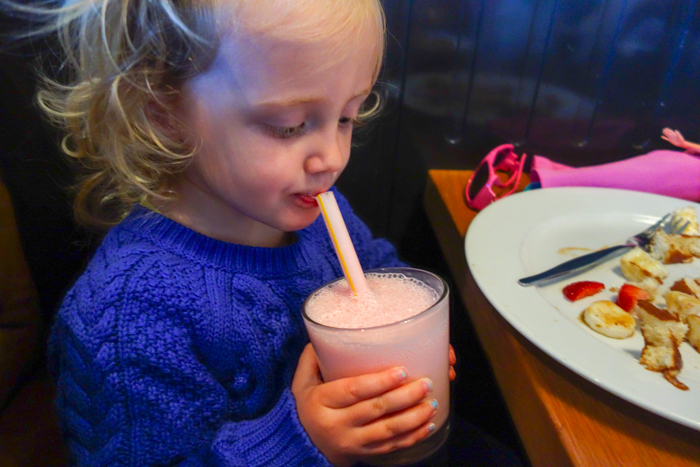 Little things like bringing the milkshake out first are the things which really add to a kid-friendly experience. Hospitality Est. pleasantly surprised us. As soon as you enter you feel like you can relax, and turning up with a big group, or with several spirited children, would not be a problem. 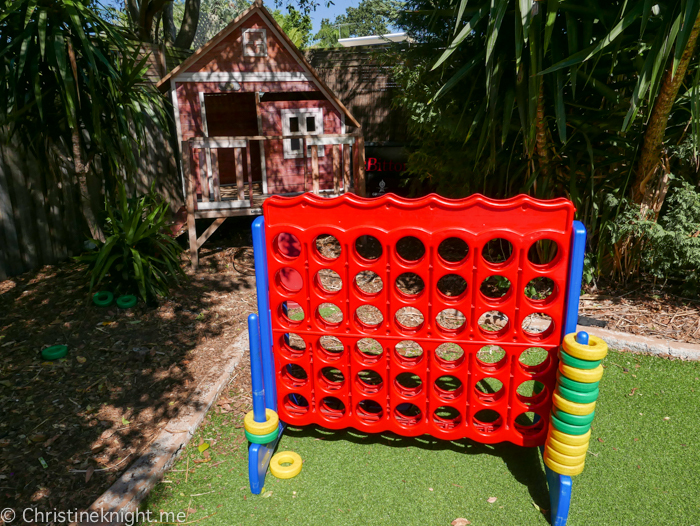 It can also accommodate several strollers, just what every family or parents’ group is after in a kid-friendly café! Last Bite: Hospitality Est. 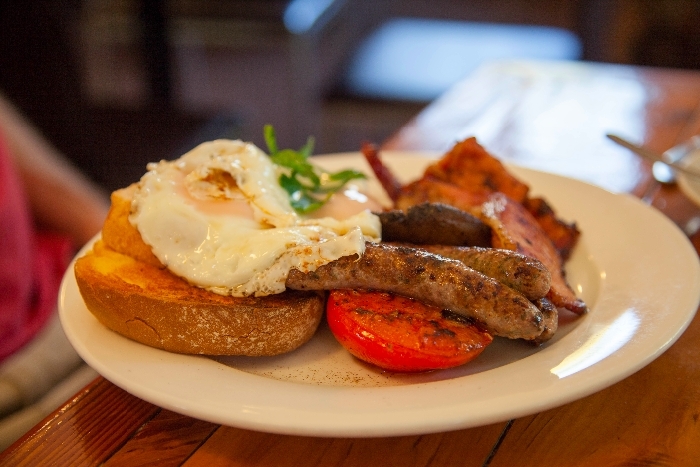 serves good quality, no fuss food for breakfast and lunch in a relaxed atmosphere. 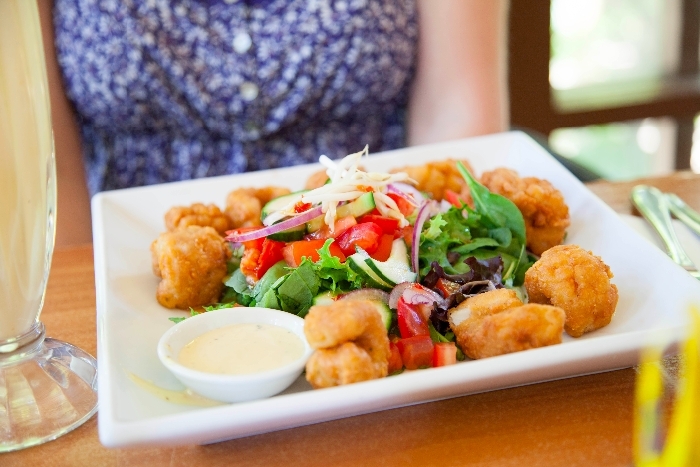 Food arrives fast, which is important when dining with little people. 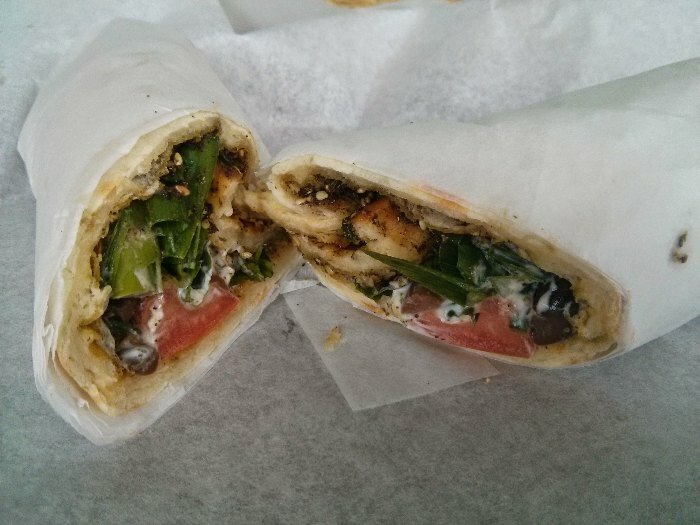 We’ll be back soon to try out the lunch menu! 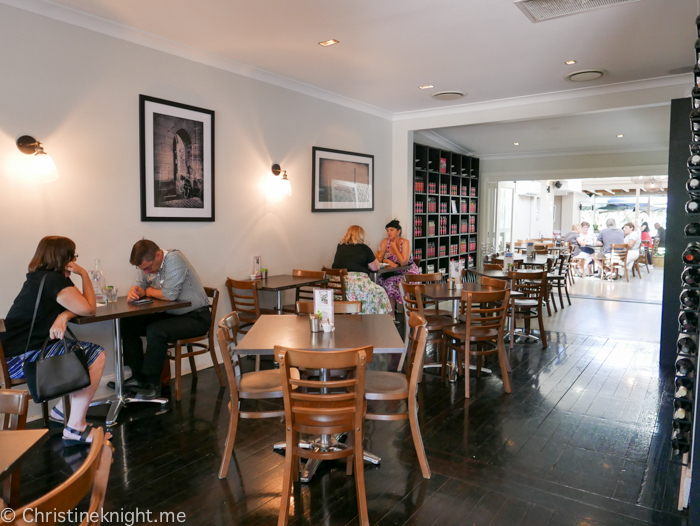 There was an ulterior motive when we decided to visit Baked Patisserie for morning tea and it centred on the rumours of magnificent cronuts and macarons to rival the king of macaron – Adriano Zumbo! 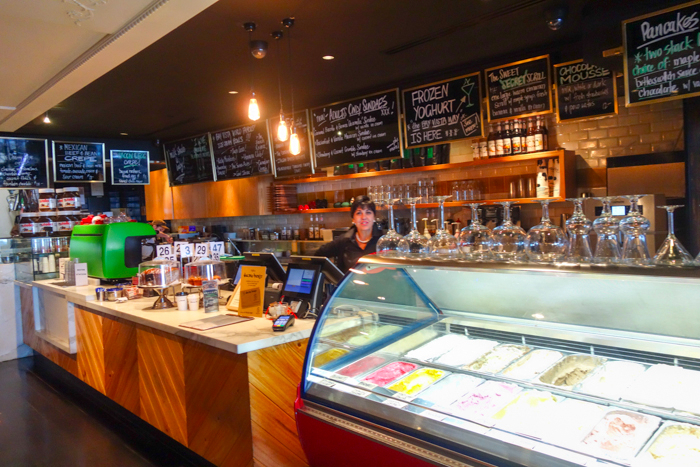 As a plus, this tucked-away patisserie appeals to kids with a range of sweet delights from an evolving menu. 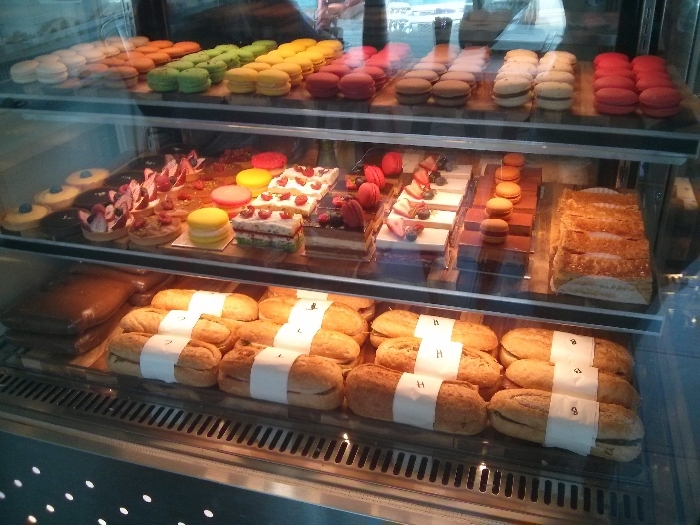 Being in the industrial side of Kirrawee, Baked Patisserie doesn’t really fit with its surroundings. 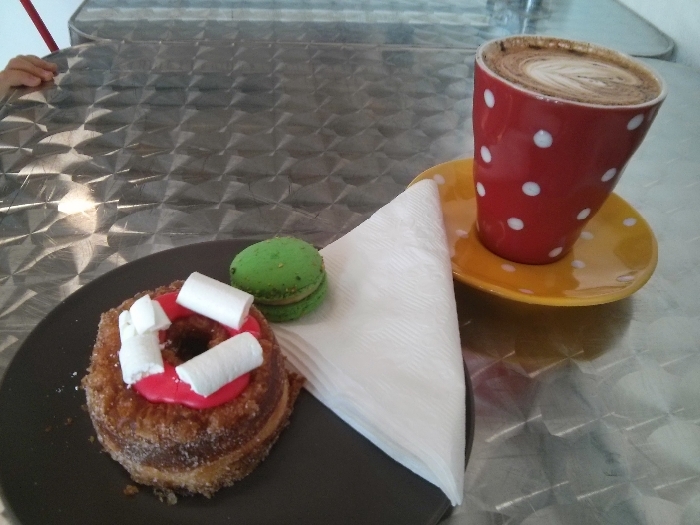 However they are building up quite a cult following and why wouldn’t they with mouth-watering treats, such as the Raspberry & Vanilla Cronut ($5), Macarons ($2.50) and a reasonable $4.00 for a large coffee. 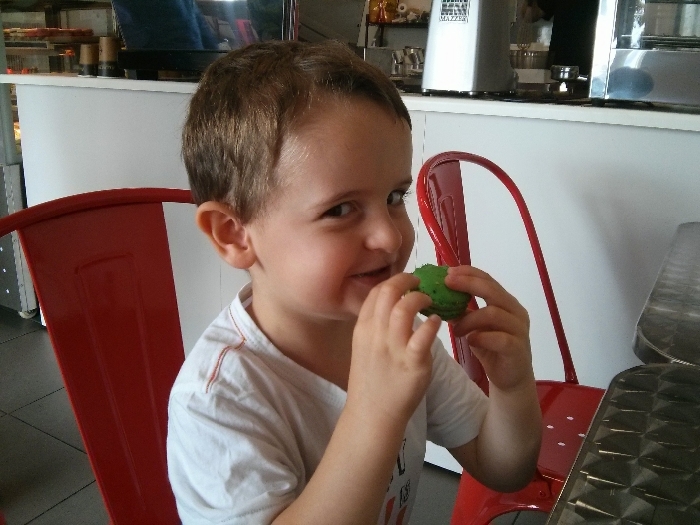 Jenson didn’t care about which flavour macaron he wanted, he went for the brightest possible colour (green) – which I believe was Pistachio and was devoured with a nod of approval. I savoured my cronut without thinking that J would soon turn his eyes to the remaining half on my plate, and in his usual negotiating style asked that we share the rest as sharing is a nice thing to do. I can’t fault his approach! Baked Patisserie certainly caters for the little people with a small train set set up alongside one wall to play with, a high chair for the littler ones, which is a good thing, as you want to savour the quality coffee on offer. 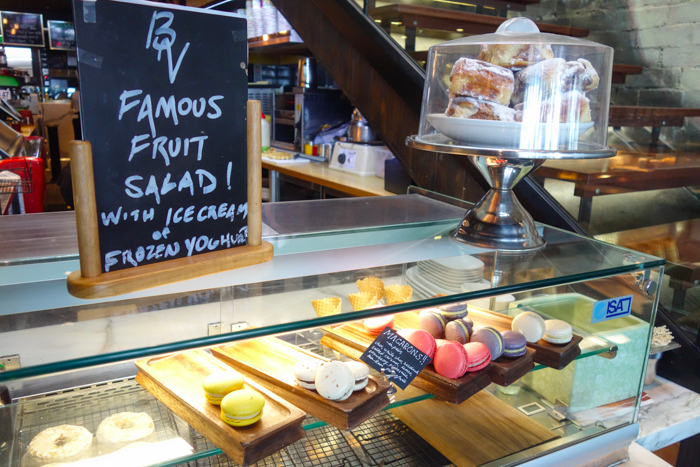 These little additions, along with the friendly service, make this cafe very kid-friendly. 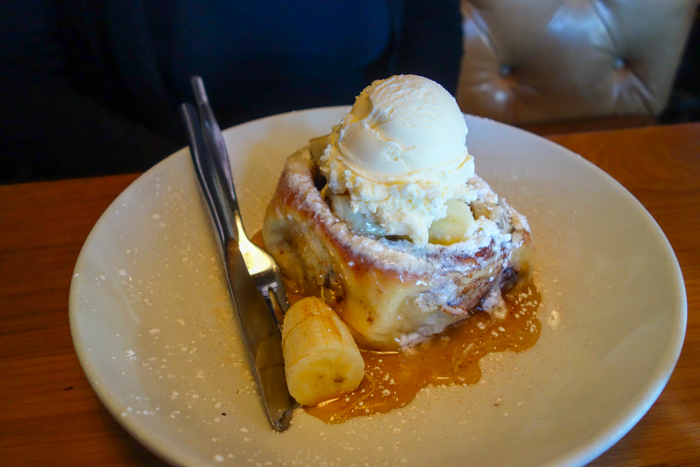 For the less sweet-tooth inclined, there are gourmet rolls ($7) and a pie warmer for more substantial offerings. 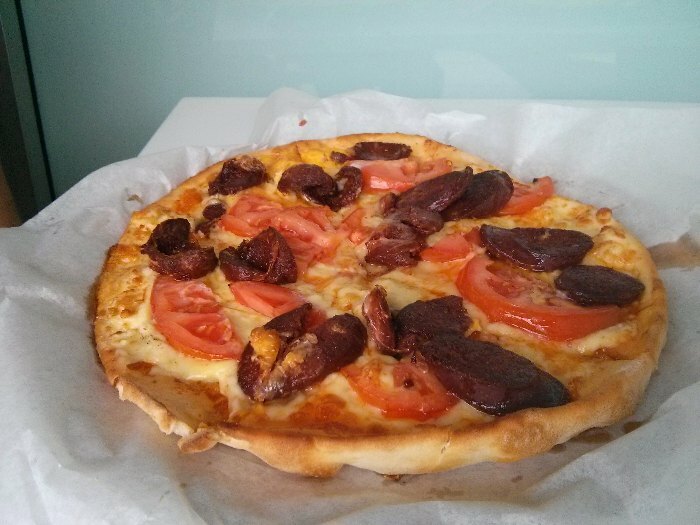 (The Moroccan Pie stood out for me which sounded delicious). Another time perhaps! 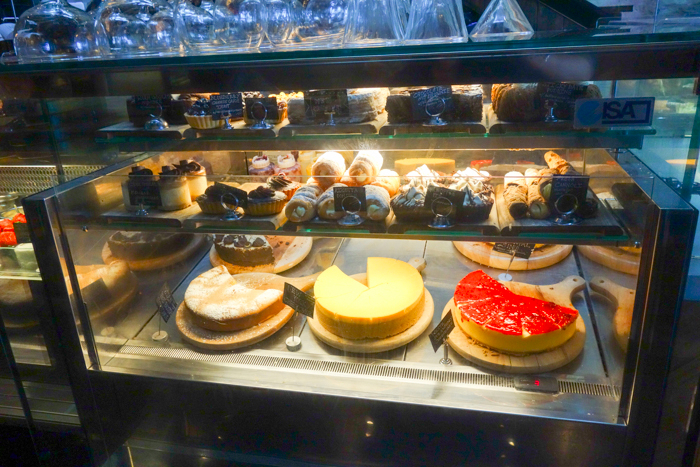 Last Bite: Baked Patisserie is a place you are going to be adding to your regular café repertoire especially when your sweet tooth is calling and the kids are needing distraction. 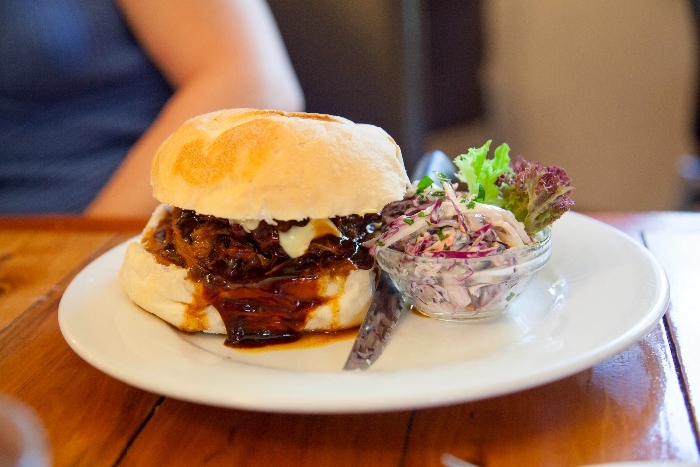 The constantly evolving menu also means there will be something new each time you visit. 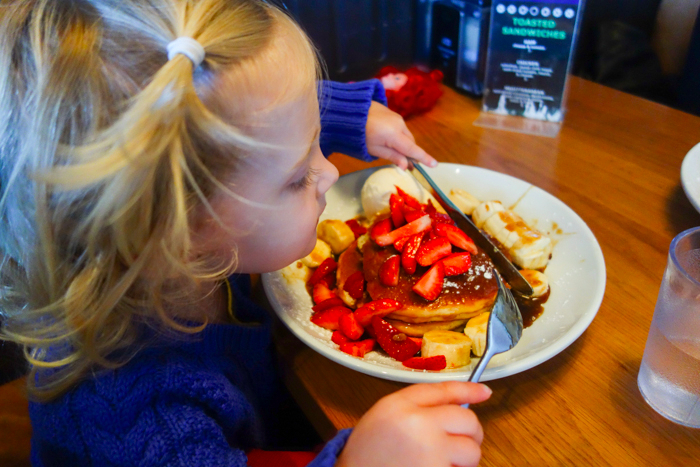 Kids Menu: Cakes and treats for all ages!